TORONTO: A resolution reached on June 20, 2018 between ‎lawyer Brian Goldfinger and the regulator of Ontario's legal profession has resulted in new case law that will aid lawyers in navigating the rules that govern lawyer advertising. A resolution agreement that was initially presented to a panel of adjudicators at the Law Society of Ontario Tribunal on June 20, 2018, stated that some of Mr. Goldfinger's advertising constituted “misconduct” under the Law Society’s rules, but that it was neither dishonest nor intentionally deceptive. After receiving the resolution agreement, the Law Society Tribunal panel ordered that Mr. Goldfinger would receive a reprimand — the most lenient sanction available. The Tribunal panel noted that each time Mr. Goldfinger was notified about concerns with his advertising, he moved swiftly and voluntarily to rectify them. The June 20 resolution in this matter ended an unpleasant ordeal for Mr. Goldfinger that began when a group of competitor lawyers in London, Ont. objected to Mr. Goldfinger's marketing of his Toronto-based personal injury law firm in their city. On June 25, 2018, the Tribunal panel released its formal order ending the case against Mr. Goldfinger with reasons to follow at a later date. Today, the Tribunal panel released those reasons. The panel dismissed a number of the misconduct allegations against Mr. Goldfinger. 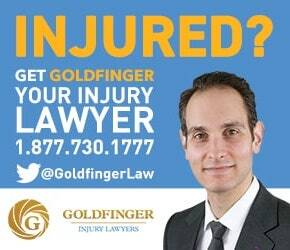 The panel made it clear that there was nothing wrong with Mr. Goldfinger advertising that he “specializes” in various areas of personal injury law because that is “literally accurate” and nothing wrong with his use of the slogan “Golden Touch”. With respect to the other allegations, the panel accepted that a reprimand was “clearly a reasonable resolution” because Mr. Goldfinger co-operated fully with the Law Society and made changes to his marketing as soon as concerns were pointed out. Mr. Goldfinger expressed satisfaction with this result. Mr. Goldfinger received a great deal of support in recent months from colleagues, particularly young lawyers and small firm practitioners seeking to supply clients with alternatives to long-established firms. "The Law Society has struggled for decades with what constitutes permissible advertising and marketing," Mr. Goldfinger said. "I hope this episode will help clarify the rules for the benefit of other young lawyers and small firm owners.” ‎ "I take pride in being a conscientious member of my profession" Mr. Goldfinger said. "I tried my best at every turn to respond to these concerns." ‎At the same time, he said, young lawyers face challenges in balancing professional requirements with the demands of the marketplace. Mr. Goldfinger and his associates meet with clients regularly in their satellite offices, which are shared spaces. Mr. Goldfinger takes a personal hand in virtually every case, in the pursuit of ensuring client satisfaction.